Josh Utter-Leyton defeated a powerhouse field to win $25,000, an invitation to the 2017 Magic World Championship, and the title of Magic Online champion! Wrapter is a Magic Online username with quite a bit of history, and today, everyone was reminded of why. Josh Utter-Leyton was known for his regular play on Magic Online long before he became a force on the Pro Tour and the eventual 2012-13 player of the year. The five-time Pro Tour Top 8 competitor has had a recent resurgence at the top tables after focusing on his day-to-day life, first earning his invitation to the next Pro Tour through a win at Grand Prix Vancouver, and now here. Utter-Leyton brought with him a Mardu Vehicles deck and vast draft knowledge, and he put up to incredible use, piloting through two days of intense competition to earn his Top 4 spot. There, he fought through Ryosuke Urase in two matches, meeting Pro Tour Eldritch Moon champion Lukas Blohon in a finals that will be remembered as one of the best in years. In the Top 4, best two-of-three matches determined the winner, and the two traded blows all the way until the ninth and final game of the day, where Utter-Leyton found himself with a perfect draw and the perfect ending to the weekend. Now, Utter-Leyton will return to the ranks of Platinum pro players, and will once again return to the Magic: The Gathering World Championship, where he will get another chance at Magic's greatest title. Congratulations to all of the competitors on making it this far, and congratulations once again to Josh Utter-Leyton on a phenomenal victory at the Magic Online Championship! Lukas Blohon, Ryosuke Urase, Josh Utter-Leyton, and Márcio Carvalho emerge as this year’s Magic Online Championship Top 4 competitors. Who will win the $25,000 first place prize, an invitation to next year’s Magic Online Championship, and the 2017 Magic World Championship invitation? Tune in on Sunday to twitch.tv/magic at 10 a.m. PT/1 p.m. ET/6 p.m. UTC to find out! Márcio Carvalho follows up his Pro Tour Aether Revolt showing with a lead at the end of Day One at the Magic Online Championship! His 6-1 record may put him ahead of the rest, but with seven rounds left to go before a cut to the Top 4, anything is possible. Be sure to tune in for Day Two of the Magic Online Championship Saturday at 10 a.m. PT/1 p.m. ET/6 p.m. UTC to see another day of thrilling action! 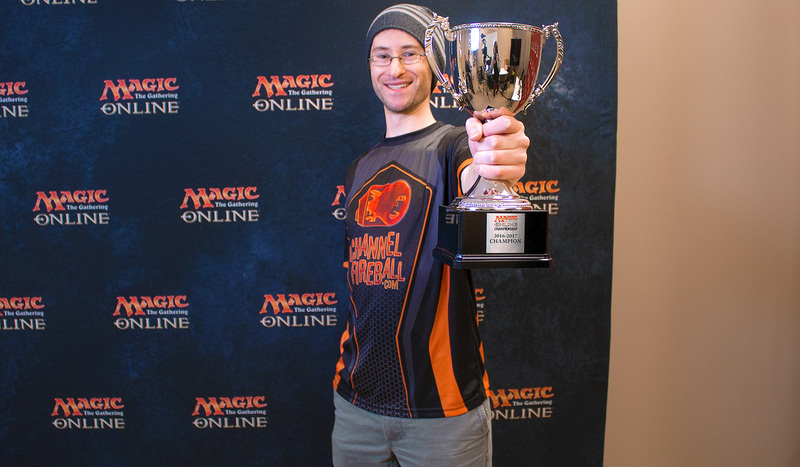 The hashtag for the 2016 Magic Online Championship is #MTGOChamp. Join the conversation! Winner will receive an invitation to the next Magic Online Championship in 2018, an invitation to the 2017 Magic: The Gathering World Championship, and Platinum status in the Pro Tour Players Club. Sixteen players will be coming to Wizards HQ next month to compete for the title of Magic Online Champion and their share of $116,000!